This feature gives librarians new choices for color coding patron penalties. In version 2.3, if the staff_alert column on the Standing Penalty Type is set to True and no other more serious penalty (as defined by the CSS) trumps it, then, when a patron incurs a penalty, a blue border will appear around the patron’s name. For example, by default, the standing penalty type, ALERT_NOTE, has the staff_alert value set to TRUE. If I apply an alert to a user’s account, and no other penalty color takes precedence over it, then a blue border will appear around the patron’s name. 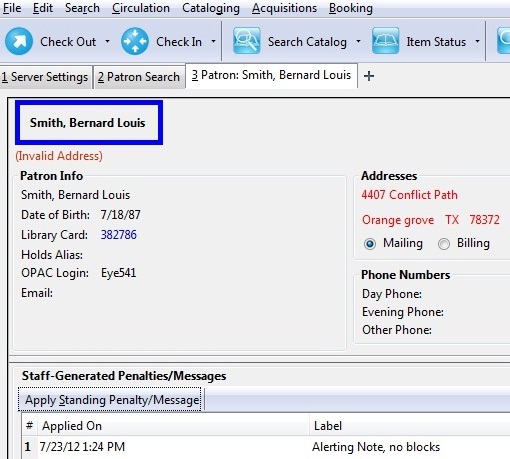 In addition, librarians now can customize the color coding on custom penalty types. For example, librarians can create a penalty type and, using the CSS classname PATRON_HAS_CUSTOM_PENALTY, apply a custom color box to the patron’s record.